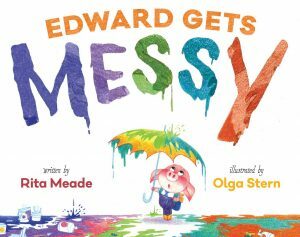 Learn more about past winners of this award, given annually to a picture book that is both a superb read-aloud and also sparks compassion, empathy, and connection. 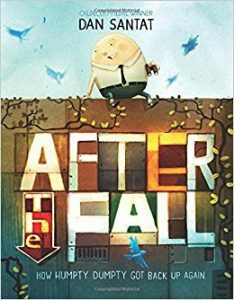 After the Fall (How Humpty Dumpty Got Back Up Again), by Dan Santat (Macmillan Children’s Publishing Group/Roaring Brook Press). Selected after a two-month-long nomination process open to the public are, these titles were reviewed by the selection committee to determine the winner. Rita Meade is public librarian who lives and works in Brooklyn, New York. Rita is contributing editor for BookRiot.com and also hosts the Dear Book Nerd podcast, a bi-weekly bookish advice show. She has appeared in various places, including American Libraries Magazine, The Huffington Post, The Village Voice, The Atlantic Wire, The Hairpin, and more. Rita also reviews children’s books for School Library Journal and occasionally writes about library-related things on her blog Screwy Decimal. Berol Dewdney, Early Childhood Educator, Baltimore, MD; Cheryl Lee, Program Coordinator-Branch Manager, Santa Clara City Library- Northside Branch Library, Santa Clara, CA: Kristine Millard, Co-Director and Youth Services Librarian, Lodi Public Library, Lodi, WI; Susannah Richards, Professor, Education, Eastern Connecticut State University, Windham, CT; and Crystal Soltren, Children’s Specialist, WORD Bookstores, Jersey City, NJ. 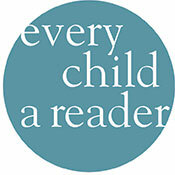 The Anna Dewdney Read Together Award is given annually to a picture book that is both a superb read aloud and also sparks compassion, empathy, and connection. The award commemorates the life and work of author/illustrator Anna Dewdney and celebrates her commitment to reading with young children and putting books into as many little hands as possible. Llama Llama Red Pajama, Dewdney’s tale of a baby llama calling out for Mama Llama at bedtime, is a beloved read-together book. 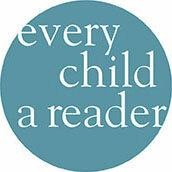 The Anna Dewdney Read Together Award, co-sponsored by Penguin Young Readers, the Children’s Book Council, and Every Child a Reader, recognizes a picture book published within the last five years (2012-2017) in the United States that kids and grown-ups are currently discovering and enjoying together. The winning book is announced during Children’s Book Week, the celebration of books for young people and the joy of reading.